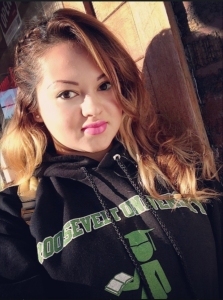 Roosevelt University senior Lucy Lopez believes in miracles. She first knew the unthinkable could be possible as a toddler when her father credited her for giving him strength and inspiration to overcome, even while the doctors predicted a spinal tumor would keep him in a wheelchair for life. Today, the 22-year-old mother of her own toddler still believes in miracles, Lopez is a recent graduate of Roosevelt University earning a bachelor’s degree in Psychology. The recipient of a full-ride, four-year scholarship at Roosevelt, Lopez chose to major in psychology in order to better understand mental conditions like depression, which her father suffered for years. “My mom kept telling him, ‘You need to get out of this mindset’ and then one day he began to take baby steps, first with a walker, next with a cane, and then on his own. It’s been truly a miracle to witness,” the Roosevelt student said. Minoring in Criminal Justice and Child and Family Studies, the psychology major has had a taste of the kind of work she’d like to do in the future most recently as a Roosevelt intern working with troubled kids in the Cook County Juvenile Justice system.